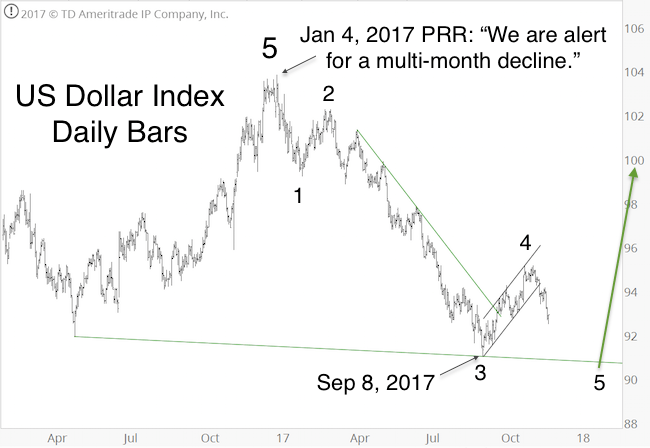 As it turns out, the US Dollar Index actually peaked on January 3, and spent the next 8 months falling lower. In August/September we were expecting a bottom, but at the time we were not sure how big of a bounce to expect. In November it became clear that the rally from the September 8 low to the October 27 high was only 3 waves, a first indication that the dollar bounce was over (a 5-wave move higher would have marked a trend change according to Elliott Wave Theory). The chart below reflects the most likely Elliott Wave Theory count, which projects a more significant low in early 2018. 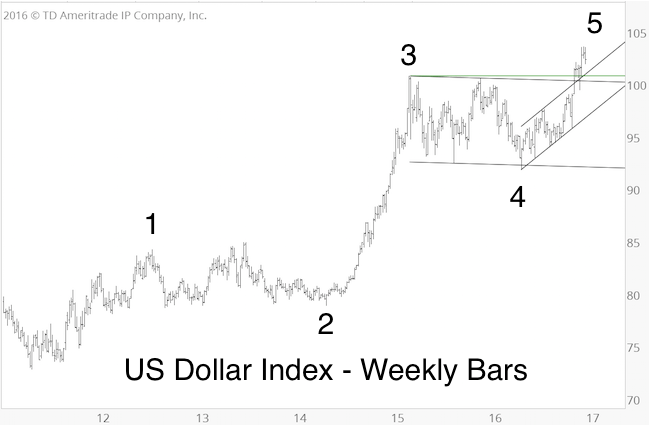 Smart money dollar hedgers are near record long the dollar, which could lead to a more sustainable rally even before the dollar reaches new lows (a solid close above 95 prior to a new low would suggest that the wave 5 low is already in). 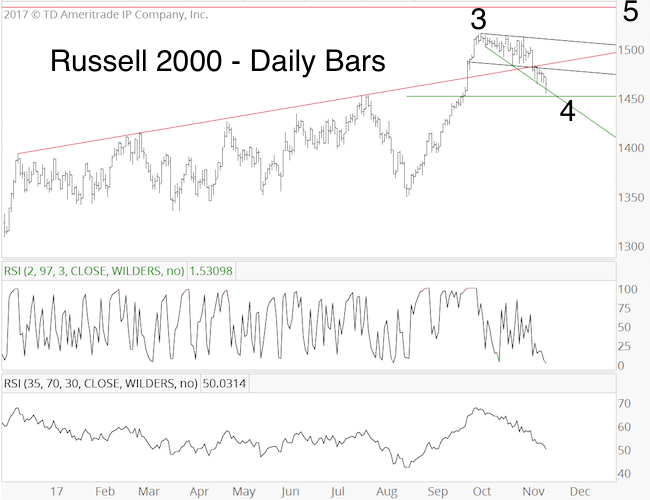 However, hedgers are often early and may become even more bullish in the coming weeks. 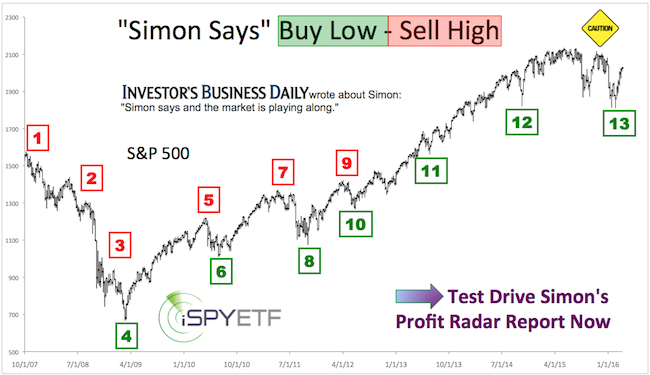 The lower the dollar falls, the better the buy signal. The euro (EUR/USD) generally moves in the opposite direction of the dollar. Since the above dollar analysis provides a multi-month forecast, we’ll use the EUR/USD for a short-term outlook. 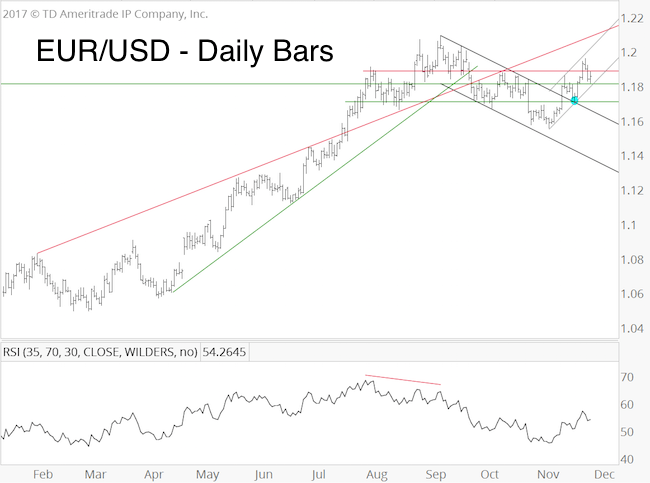 On November 14, the EUR/USD broke above the black trend channel, and re-tested that channel on November 21 (blue circle). We now expect a rally above 1.21. 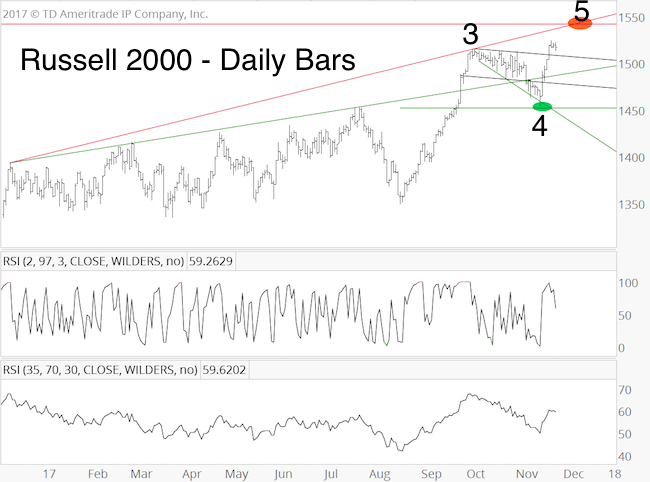 The gray trend channel provides some short-term support/resistance levels. Trade should not drop below 1.17. RSI appears unlikely to confirm new highs above 1.21, which would harmonize nicely with our expectation of a larger pullback. Smart money euro hedgers, however, are nearly record short the euro, which will draw the euro down eventually. We’d love an opportunity to short the euro above 1.21 against a bearish RSI divergence. 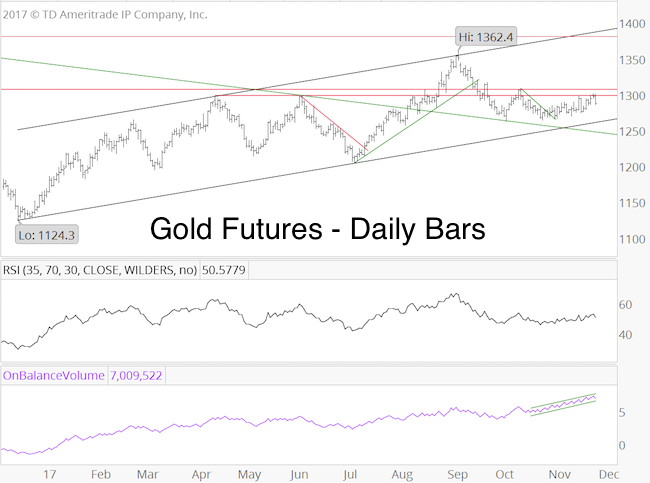 This September 28 article included a detailed long-term outlook for gold. Gold is pushing the upper boundary of the outlined trading range, but thus far there’s been no breakout. Silver failed to confirm gold’s push higher, which can be a warning signal. On balance volume has been increasing, which is a positive. Nevertheless, we would view a break above 1,307 with suspicion. Continued forecasts for the US Dollar, EUR/USD, gold and silver are available via the Profit Radar Report.